Results: The publisher called us a few weeks after the ad ran and informed us that this ad had drawn over 4,000 leads, more than any other ad in the history of the publication. 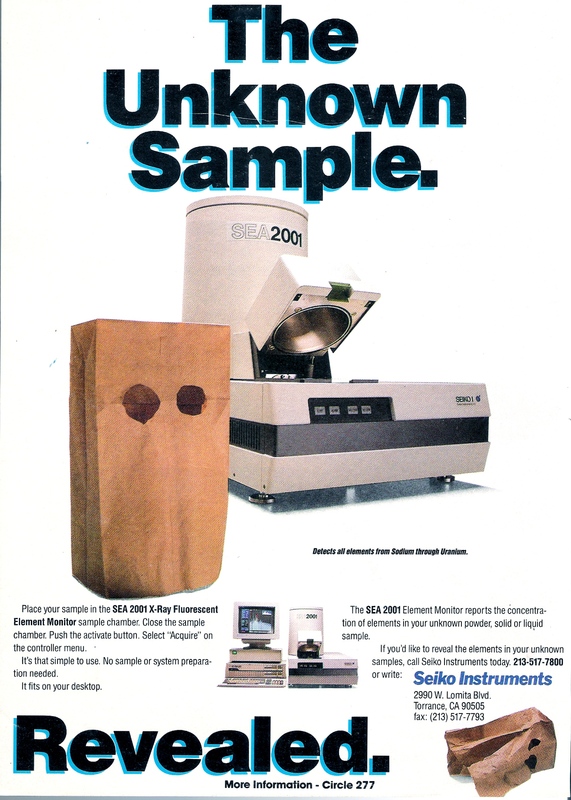 Results: This was the first ad Seiko Instruments had ever run in any semiconductor publication. It also happened to be a month in which the publisher conducted a readership study to rate each ad's effectiveness with the readership. Winners in such surveys tend to be large, repeat advertisers who buy 2 page spreads. This ad finished second in the readership survey, missing #1 by a fraction of a point. In addition, the client received multiple leads and sold many robots into this market. 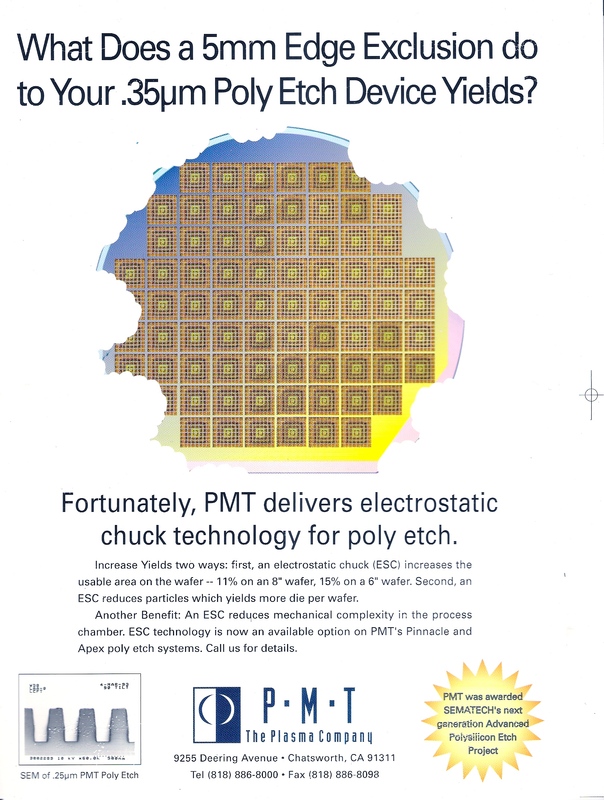 Background: PMT had developed a new etch technology that offered superior performance over existing technologies. 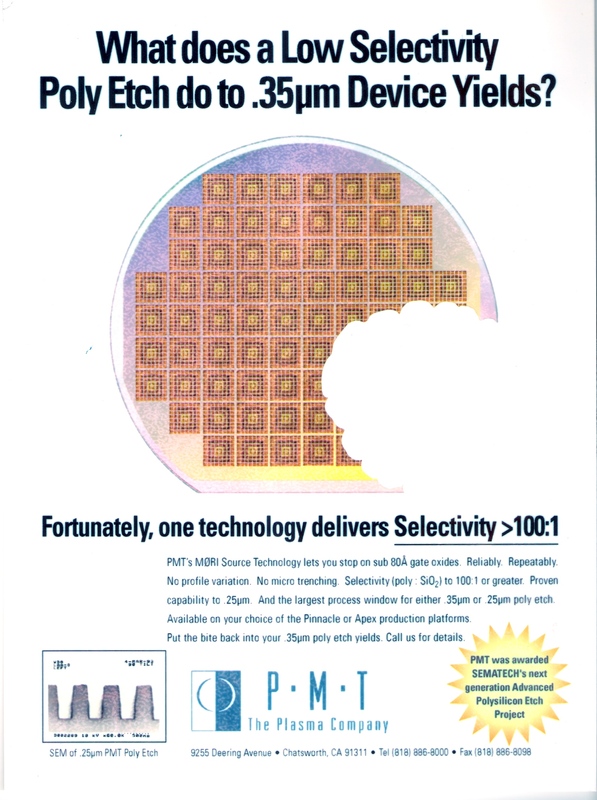 They offered customers a substantial increase in yields, always crucial in the highly competitive and cost-sensitive semiconductor industry. We recommended that the series of three ads run in Semiconductor International. We also produced a set of three matching brochures for use at the upcoming industry trade show and as follow-up mailers. Results: Not long after the ads ran, the President called me into his office and related that their chief technologist had recently attended an industry technical conference. 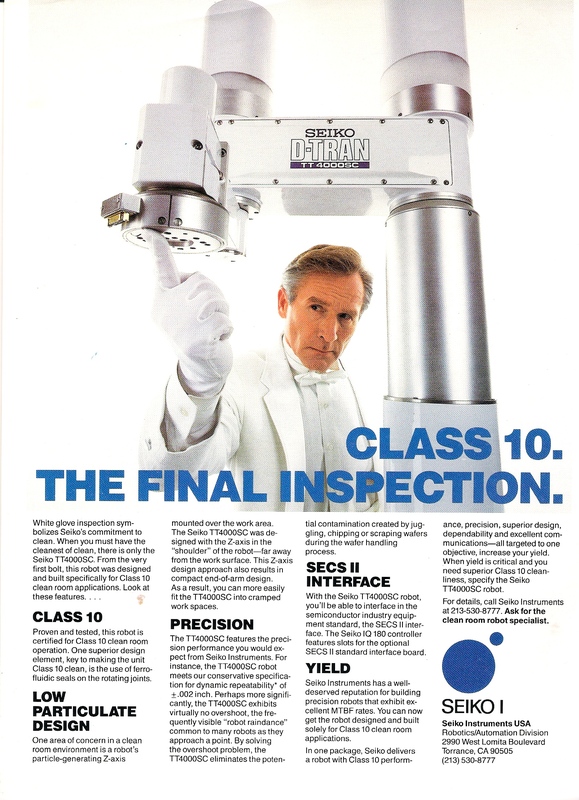 At one point, a competitor stood and declared that PMT's ads were "unfair." Since the company's objective was to gain industry visibility, the president considered this a very positive sign that, in fact, the ads had caught the industry's attention. The company was eventually purchased by a larger player in the industry. Background: When we met with the client, the VP Sales insisted that quality was their number one benefit to advertise. Despite our best efforts, my designer and I could not dissuade them from this conviction. With a background in manufacturing processes and quality, I interviewed the quality control manager, a guy named Hugo. He was extremely enthusiastic about quality control and the dedication of their manufacturing team to produce motherboards with zero defects. 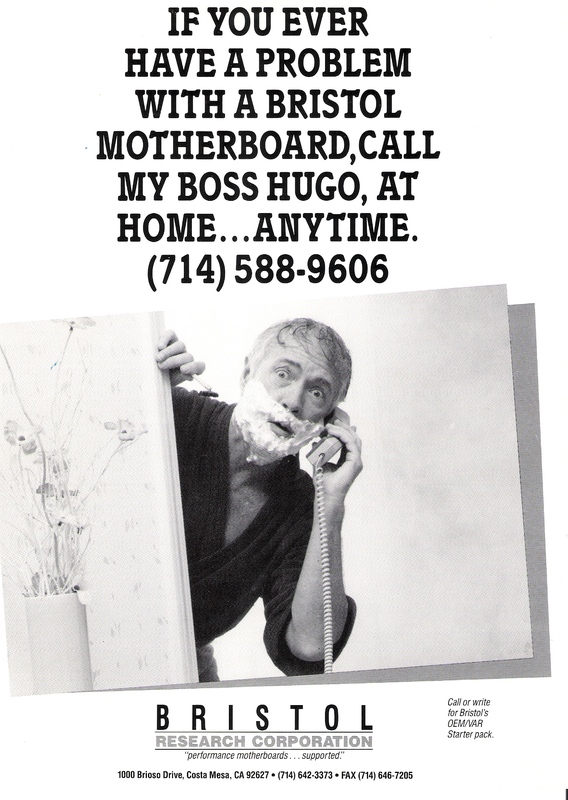 At our suggestion, we decided to personalize the concept of quality in the "persona" of Hugo, actually installing a working number corresponding to the ad copy in his home. We also suggested running a much lower cost b/w ad and spending a little more on photography and a model. (Double click thumbnail for full sized ad. 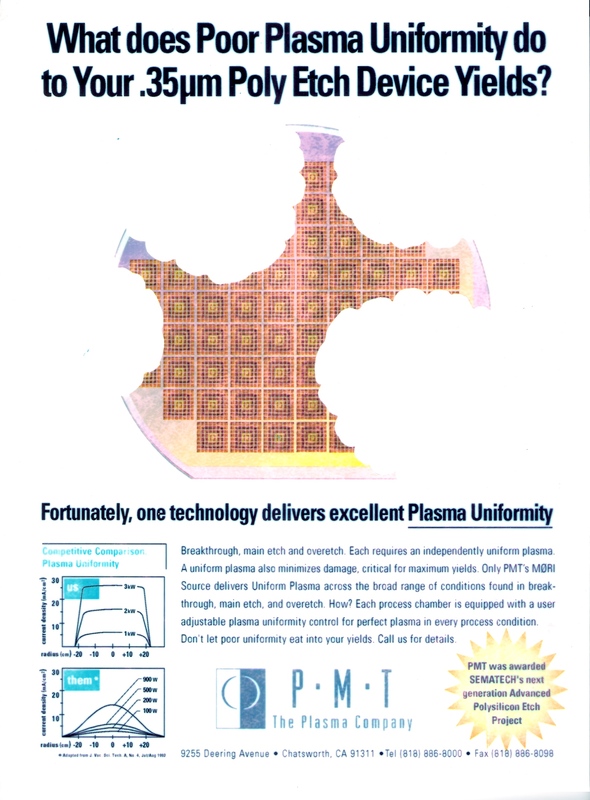 Results: The ad ran in the upcoming trade show daily. A competitor bought the company at the trade show.